We designed the Komodo coffee table simply to be the biggest, chunkiest and most striking centre-piece table you could imagine in your living room. And we engineered it to last forever. Customise your Komodo to express your personal style and it will be your favourite piece of furniture, and the envy of every visitor to your home. 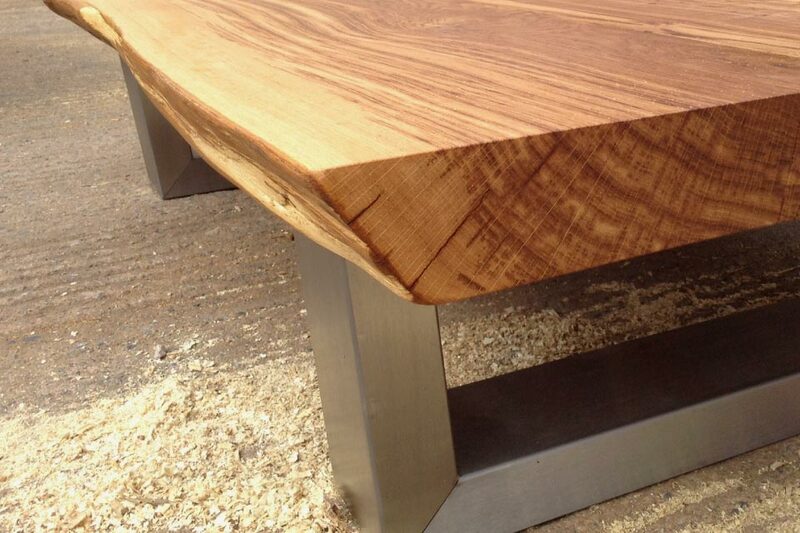 The signature of the first Komodo was a thick live natural edge along the full length of the table, where the outside edges of the table are taken from the true authentic curve of the tree trunk, hand-finished to a beautifully smooth and incredibly tactile surface that you won’t be able to take your hands off. But since that first table, many of our customers have chosen a Komodo to fit into a more classic style of home, so you can also choose a traditional square-sided table top with gently softened edges, precision hand-finishing in a centuries old style for the modern world. The Komodo design is all about combining the biggest and boldest materials, both natural and man-made, to make a striking visual impact in a room. 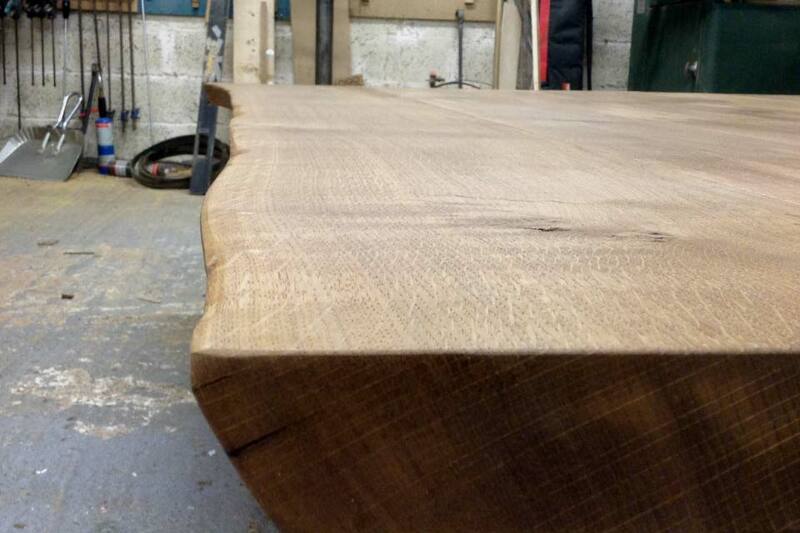 So the table comes with the option of our biggest, chunkiest 65mm oak top, so thick you can barely grip it in your hand. Or for a more understated table, you can also choose a thick 52mm oak top, still far more chunky than any conventional oak table but just a slightly more subtle style of Komodo. The chunky steel Komodo base has a precision quality unlike any other table, every frame being invisibly hand-welded from 120 x 60mm steel. For extra storage space you can add a 10mm thick toughened glass shelf, a practical feature with a strong subtle style. For the finish of your Komodo base, choose either hand-brushed high-grade stainless steel or from our huge colour palette of durable matt or high-gloss powered coated finishes. Or for something extra special, you can have a perfect match to your room with a custom powder coated base in any RAL colour, matt or high-gloss. 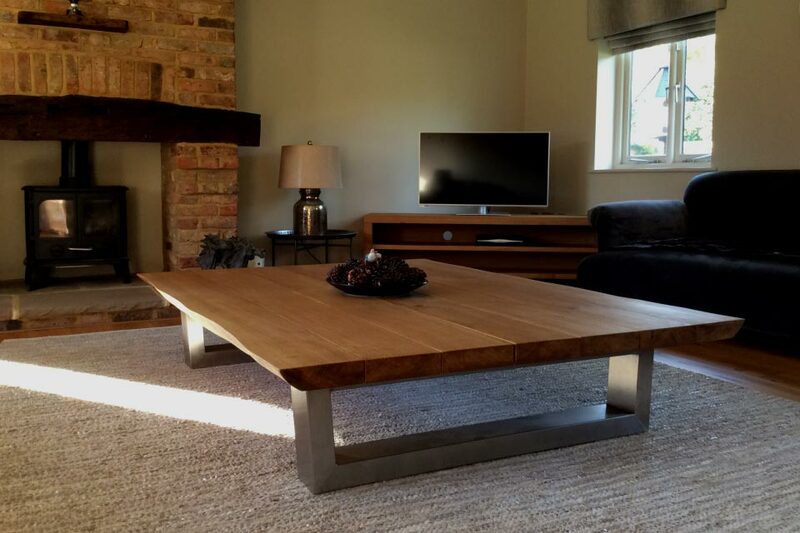 We know that the size and shape of a coffee table are critical to get the perfect balance of maximum functionality and fitting a room perfectly. The Komodo is a special design because it comes in a choice of rectangle, square or round table shape. And we custom build every table to order, which means you can choose the exact size you want and ensure your table will be the perfect fit for you and your space. Every Komodo coffee table has a unique look of exceptional quality. Because we buy our oak in whole trees and process the timbers ourselves, our Komodo tops aren’t the usual mass-produced jigsaw of glued-together small pieces of oak. Instead, every table top is made from single pieces of real solid oak so that the beautiful oak grain flows unbroken along the entire length and thickness of the table. And we make each table that little bit more special by hand-selecting the oak from a single tree. The Komodo table top comes in a range of 4 natural colour tones, in an extremely durable and user-friendly finishing oil that can be quickly refreshed once every 12 months to keep a table looking like new.